In these lessons, we will learn how to shade required regions of a Venn Diagram. We will learn how to shade regions of two sets and three sets. A Venn Diagram is a pictorial representation of the relationships between sets. A' union B, A' union B' = (A intersect B)', A' intersect B' = (A union B)'. 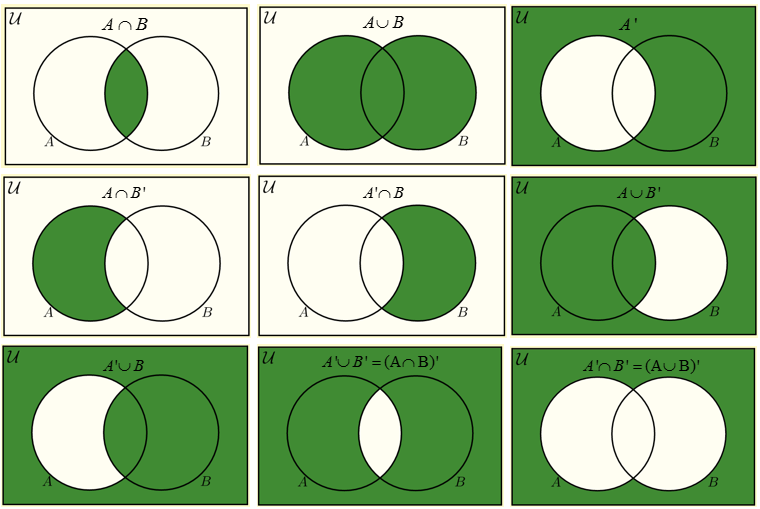 Scroll down the page for more examples and solutions on how to shade Venn Diagrams to represent the required regions of two sets and three sets. How to shade the union, intersection and complement of two sets? How to shade regions of Venn Diagrams involving three sets? Part 1 of 2. How to shade regions of Venn Diagrams involving three sets? Part 2 of 2.